Coughing fits, fake pink slips and a disintegrating message overshadowed the U.K. prime minister's attempt to rally her party. U.K. Prime Minister Theresa May just lived out every one of your public speaking nightmares during the annual U.K. Conservative Party conference. May's speech was meant to rally her party behind her after a disappointing general election sheared its numbers in Parliament. 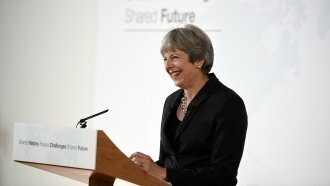 May said, "This Conservative Party must pledge to renew the British dream in this country once again." But the prime minister was betrayed three times during her speech: first, by her own larynx. A heavy cough plagued May throughout the speech, periodically undermining her talking points. May couldn't shake the cough despite a Cabinet member's timely intervention with a lozenge, though she made light of it after the fact. May's second betrayal came from the audience, which concealed a man waiting to rush the stage to give May a fake government pink slip dismissing her from her job. The prankster said Foreign Secretary Boris Johnson asked him to deliver the memo. Johnson's reportedly been considering taking a stab at May's position; her conference performance may have added fuel to the fire. At the end of her speech, May was betrayed once again by her own message, which literally fell apart as she was speaking. As political metaphors go, it's rather heavy-handed. Granted, most of this stuff was about the style of this speech rather than the substance. But May has an admitted style problem — she opened her speech by apologizing for a general election campaign that was "too scripted, too presidential." But the speech did have a solid bit of substance to placate the critics: May announced her government would spend an additional $2.6 billion on affordable home projects.